Over the last 25 years, more than a hundred dictator game experiments have been published. This meta study summarises the evidence. Exploiting the fact that most experiments had to fix parameters they did not intend to test, in multiple regression the meta study is able to assess the effect of single manipulations, controlling for a host of alternative explanatory factors. The resulting rich dataset also provides a testbed for comparing alternative specifications of the statistical model for analysing dictator game data. It shows how Tobit models (assuming that dictators would even want to take money) and hurdle models (assuming that the decision to give a positive amount is separate from the choice of amount, conditional on giving) provide additional insights. The online version of this article (doi: 10.1007/s10683-011-9283-7) contains supplementary material, which is available to authorized users. Blackwell, C. (2007). 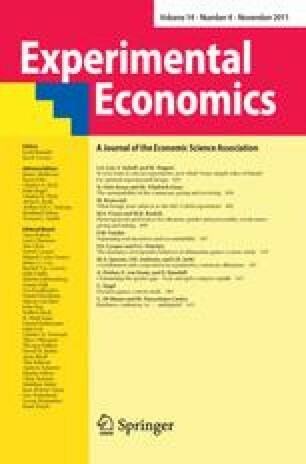 A meta-analysis of tax compliance experiments. http://aysps.gsu.edu/isp/files/ISP_CONFERENCES_TAX_COMPLIANCE_AND_EVASION_BLACKWELL.pdf. Brosig, J., Riechmann, T., & Weimann, J. (2007). Selfish in the end? An investigation of consistency and stability of individual behavior. http://mpra.ub.uni-muenchen.de/2035/1/MPRA_paper_2035.pdf. Hopfensitz, A. (2009). Previous outcomes and reference dependence. A meta study of repeated investment tasks with and without restricted feedback. http://mpra.ub.uni-muenchen.de/16096/1/Hopfensitz_2009.pdf. Leider, S., Möbius, M. M., Rosenblat, T., & Quoc-Anh, D. (2009). What do we expect from our friends? https://mercury.smu.edu.sg/rsrchpubupload/15345/ExpectFriends.pdf.